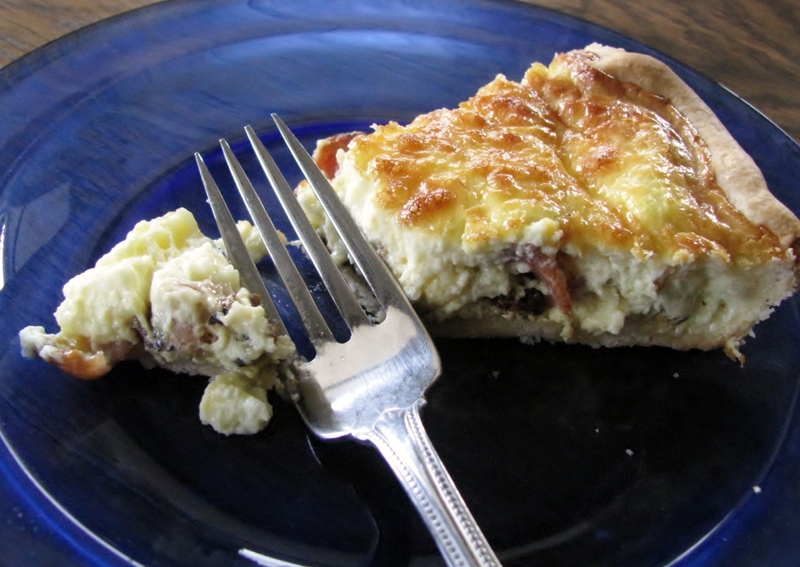 From the Lorraine region of France which was named for Charlemagne’s grandson, this quiche is French, French, French, from the name Lorraine to the Gruyère cheese. Sauté the bacon. You may use slab bacon from the butcher and cut it into cubes or use the sliced variety in the package from the supermarché (supermarket). Even supermarket sounds nice in French! If you do not eat meat and do not want to put the bacon in it, it is technically no longer Quiche Lorraine, or maybe it is bacon-less Quiche Lorraine. No worries. 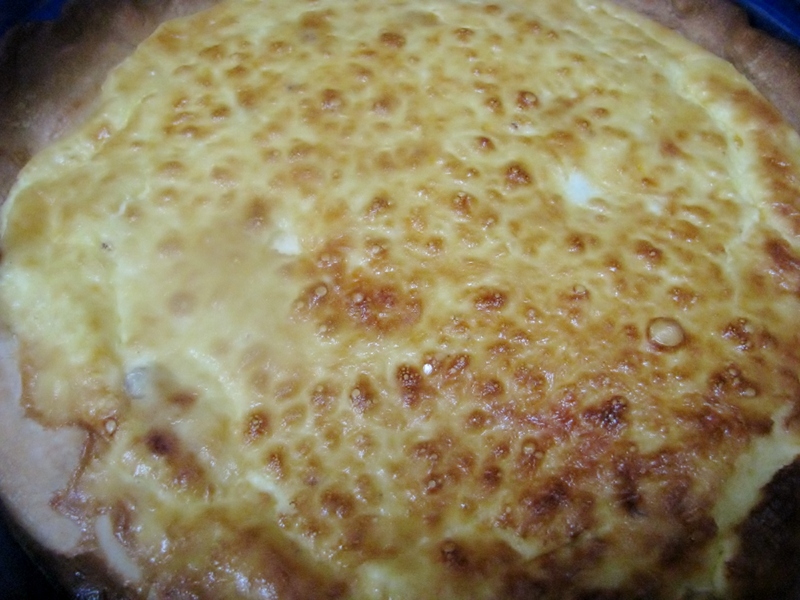 The cream, eggs and cheese make a delicious custard center, with or without the bacon. Many American quiche recipes contain milk and no cream, so the quiches here are like a solid lump of scrambled egg, similar to a frittata. 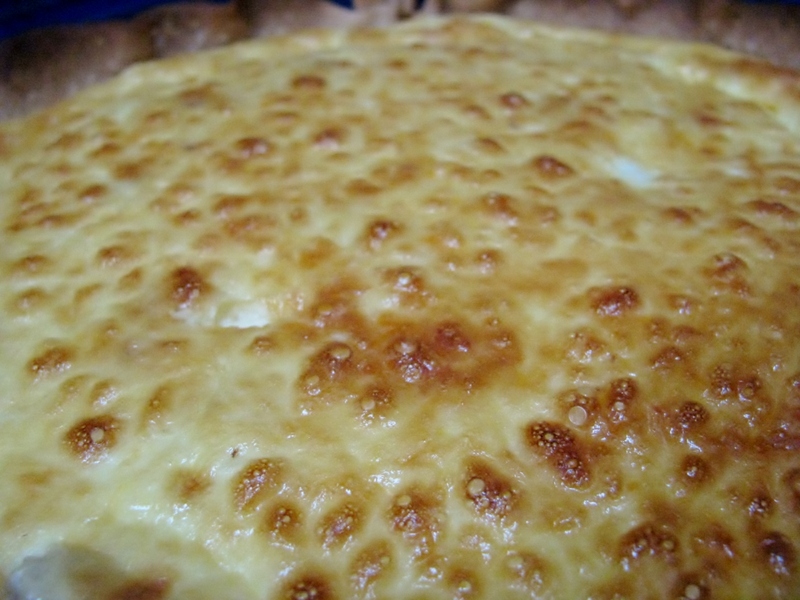 I love a good frittata, too, but the consistency of this quiche is warm, custardy heaven. If you want scrambled eggs, make scrambled eggs. If you want a quiche, aka warm, custardy heaven, make this! 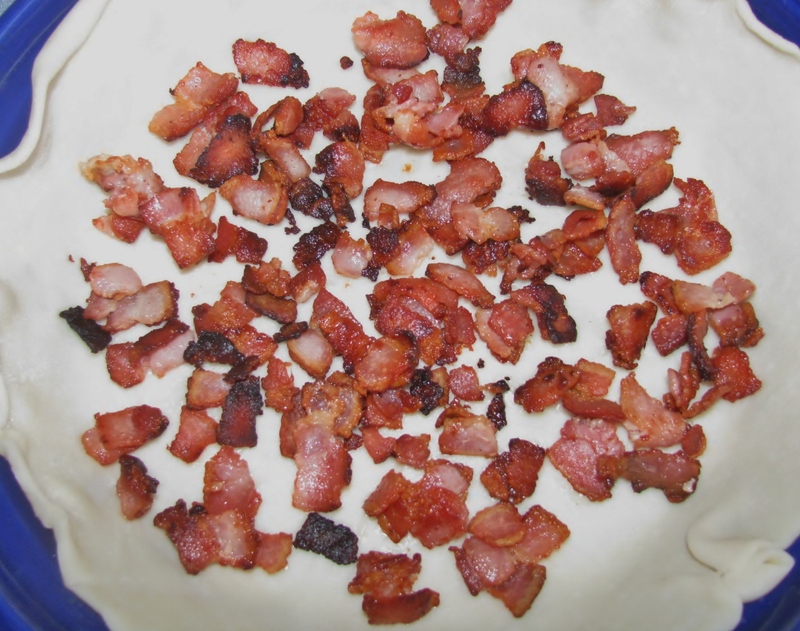 If this bacon looks surprisingly familiar, it’s because I failed to take pictures of the bacon while it was cooking, so I borrowed these photos from my Bacon and Onion Tart recipe. 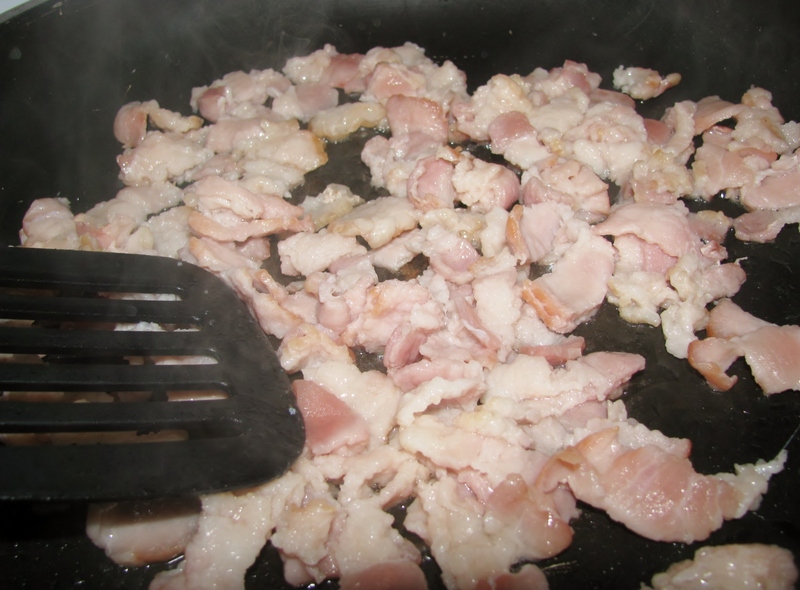 Pay attention while sautéing the bacon so it is evenly cooked or you will end up with some pieces that are black and some that are nearly raw. It’s bacon. It will still taste good, but please do as I say, not as I do. 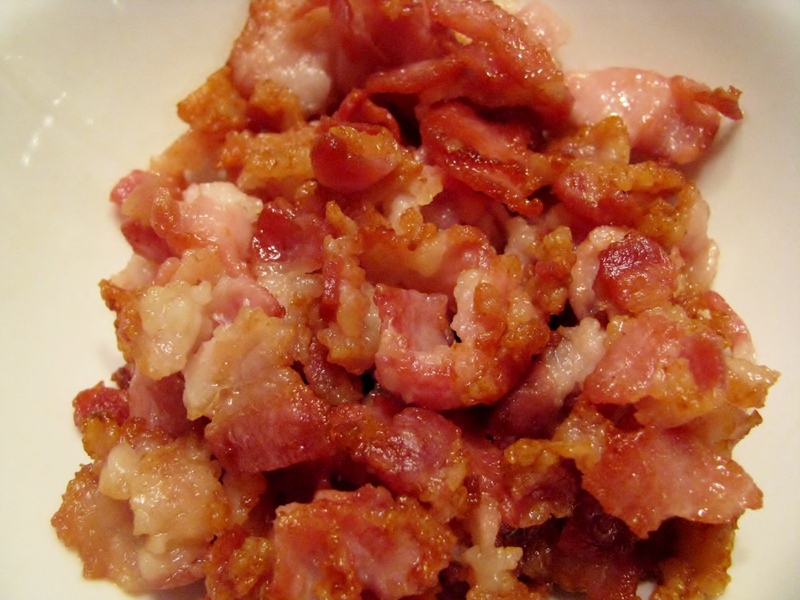 See black and raw bacon below. 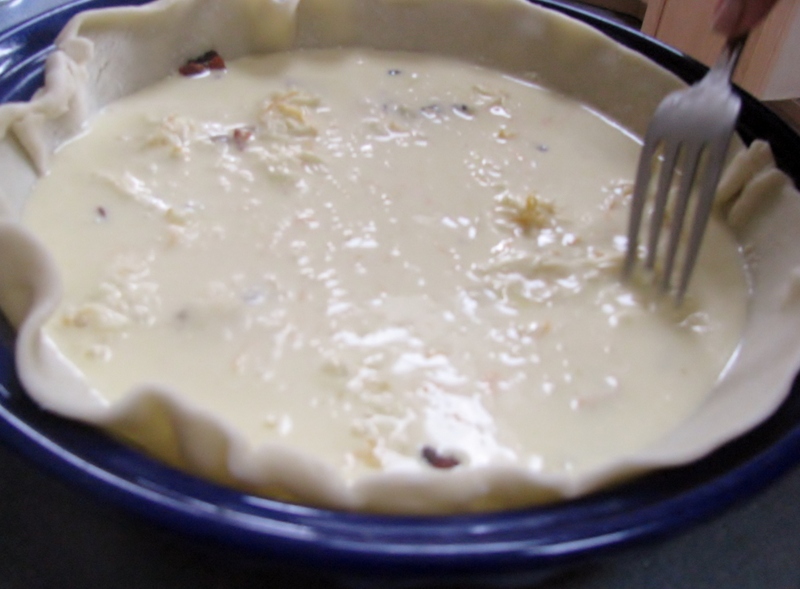 Place pie crust in quiche or pie pan. Spread bacon evenly over crust. 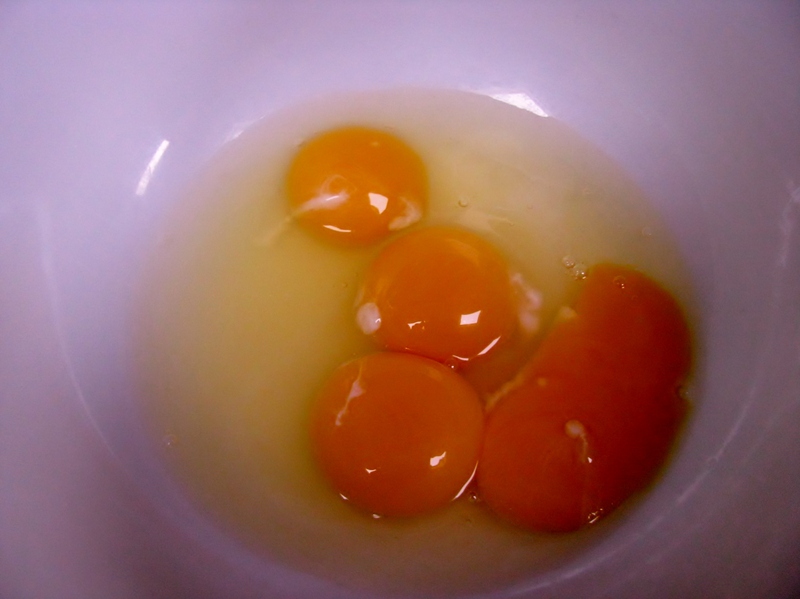 Put two whole eggs plus two egg yolks in a bowl. I discard the unused whites. I have tried to save them for a later use, but when I take the container of egg whites out of the refrigerator, I can never remember how long they’ve been in there. Then I wonder if we’ll all get salmonella if I use them, so I throw them away. Unless you have a use for them on the day that you make the quiche, just throw them away so you will have more room in the refrigerator and spare yourself from having hypochondriatic thoughts of salmonella, like I have. Add light cream OR heavy cream and milk. And try to focus your camera when you are taking pictures to post on your blog. Sorry that the eggs and cream appear a bit blurry. Doesn’t cream just make you happy? Add the cheese. I must confess. This is not Gruyère cheese. Although I love it, my kids do not. Sacrilege for a Quiche Lorraine, I know, but I substitute a blend of Monterey Jack and Cheddar. Then when it’s time to eat, I sprinkle some shredded Gruyère on my piece of quiche. If you don’t want to use Gruyère, you can use Swiss or any cheese you like, preferably one that is shredded and melts easily. 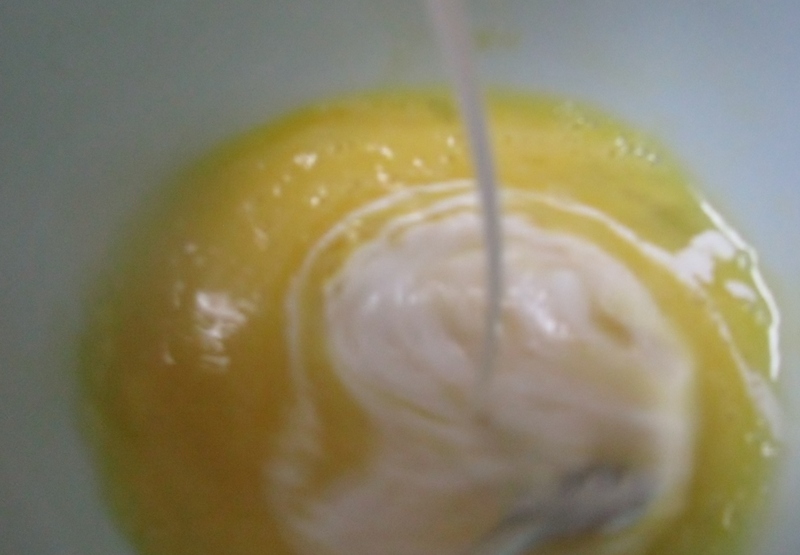 Pour the egg, cream and cheese mixture over the bacon. 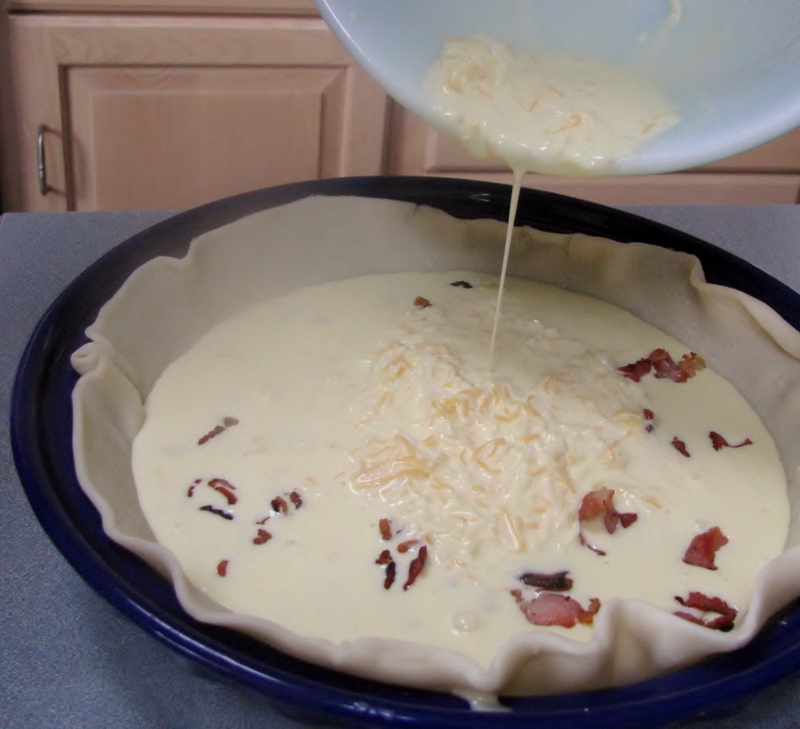 With a fork, evenly distribute the cheese and push the bacon back down to the bottom as pieces sometimes float up when the eggs/cream/cheese mixture is added. Ready for the oven. 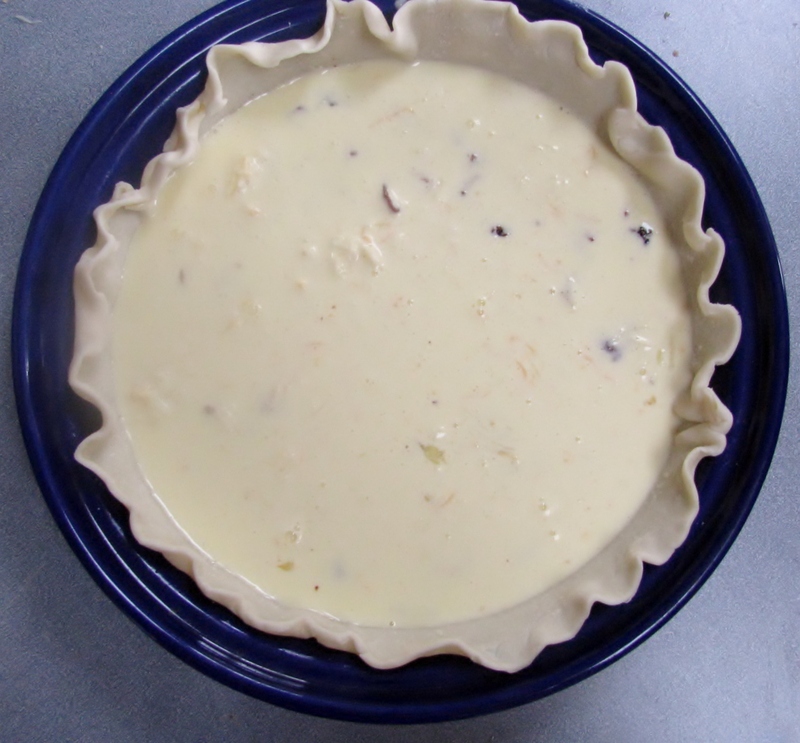 Note that this is a refrigerated tart or pie crust from the grocery store that you unroll and place in the quiche dish. For me, this dish is all about the filling. The crust is just part of the dish that holds the filling. If you are a crust lover, by all means, feel free to make the tart shell from scratch using your favorite recipe. Et, voilà! Light golden brown on top. No words for this. Just smell and taste of warm, custardy heaven! Delicious! Serve with a nice salad. Enjoy! 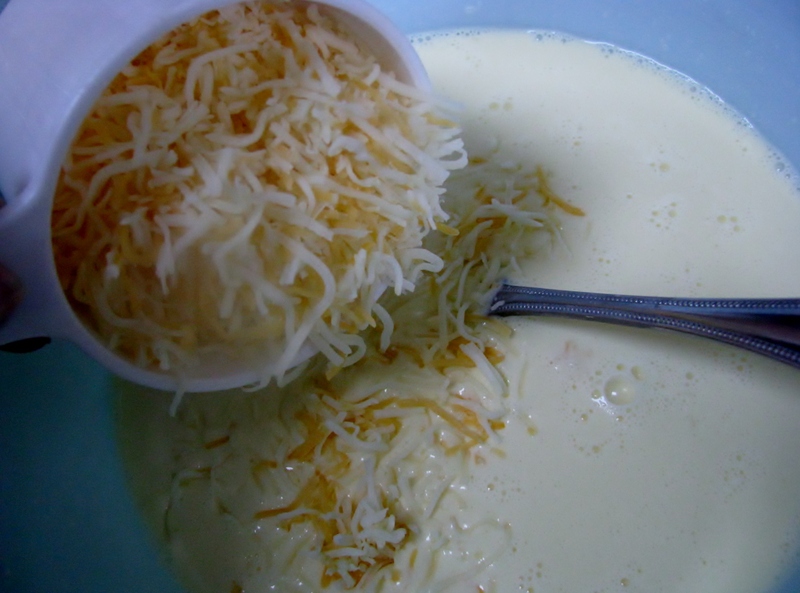 1 cup diced or shredded Gruyère cheese, Swiss or cheese of your preference. Place the prepared crust in a buttered pie or quiche pan. 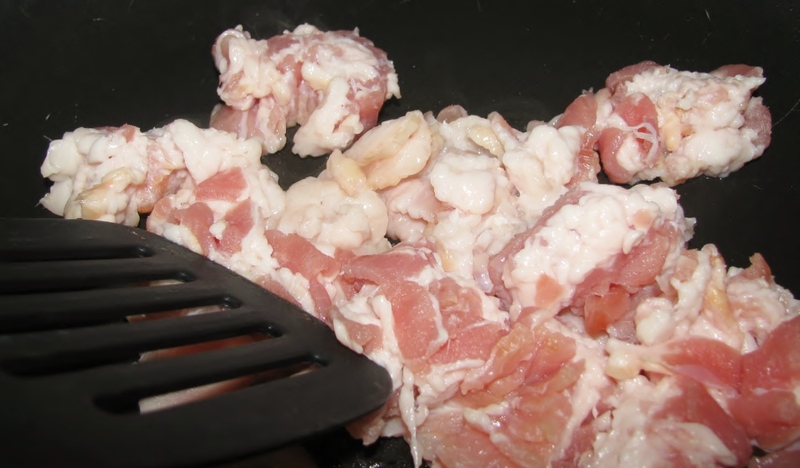 Dice bacon into small cubes and sauté to desired crispiness. Drain, cool for a few minutes, then sprinkle evenly over pie crust. Break two eggs into a bowl. Add two more egg yolks only. Beat eggs and yolks with a fork or whisk. Add light cream (or heavy cream and milk) and stir. Season with salt, pepper, and any herb or spice that you like. Stir in cheese. Pour egg/cream/cheese mixture over bacon. Bake for 30 minutes. I have never tried to make this with an egg substitute, so I don’t know whether or not that would work. Good luck with the testing. I hope you’re only allergic to liver and turnips. Merci bien! I see you mentioned Tarte Tatin in your post, too. I will be posting a Tarte Tatin soon. Thanks for stopping by.